Some things to consider moving forward toward manufacturing is the time and effort put into designing your part for manufacturability. As your project makes its way through the progression of its development, your original model may need to be altered to fit the manufacturing process. As we have shown, each process has different accuracy and resolution attributes. They also have inherent design limitations. In other words, designing for one is different than designing for another. Therefore, the design considerations you need to make at the start of your project will impact the costs associated with production. 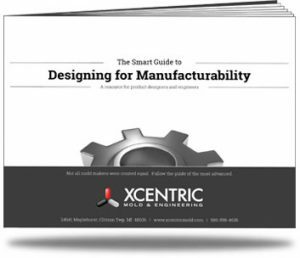 When designing a part destined to be additively manufactured, it is important to understand that some design features may need to be altered for production. Larger parts outside the space limitations of your chosen process can be broken up into smaller pieces and assembled later. Avoiding sharp edges in your AM design can improve accuracy. Be aware of overhang – geometric angles larger than 45 degrees will require supports which could limit the complexity. Thicker walls and hollowed interiors can reduce print time (SLA parts will need drain holes incorporated on all hollowed-out features). CNC machining is an option for prototypes as well. The benefits include being able to achieve tight tolerances and creating objects out of the exact production material needed, both metal and plastic. However, if production of more than 50 parts is required, it can become costly in both time and money. Part features can be as thin as 0.020 in. Internal Threads can be achieved. Injection Molding is usually the preferred method for producing production parts. And because injection molding is economical in as few as 50 parts, it could be wise to design directly for the injection molding process if a production run is already in the budget. With that in mind, we’ve produced a helpful guide to help you learn a little more about what it takes to design a part for the injection molding process.